For some people performing a simple task like holding a spoon, writing with a pen and doing anything that involves the use of fingers can be a big and sometimes painful task. To make it easy, pain-free and convenient there are plenty of holders and assistance devices available. Let’s go through the most common of all. Carex Spoon and Fork Holder are great for arthritis sufferers, or those with poor dexterity or weakened grip. Their special design helps to create a larger surface for holding eating utensils and is easily removable to take along when eating. It can slip onto most standard spoons and forks. Buckingham CoolHand Hot Plate Holder is ideal for those with arthritis, limited hand dexterity and impaired pincer grip of thumb and forefinger. It uses the power of leverage to lift plates so that the entire hand takes the weight, not just the fingers. The plate is gripped and released as simply as using a hand, this is the easy way to carry plates even directly from the microwave. It is easy to keep clean and has no dirt traps. For people who are fond of playing cards, automatic card shuffler can extend the smile on their faces. Automatic Card Shuffler quickly shuffles one or two decks of playing cards. Just push a button for speedy shuffling in seconds. It is easy to operate and requires four "AA" batteries. Deluxe Card Rack has walnut-stained fiberboard which holds all the cards easily. Grooves are slanted and rack is tiered for good visibility. Hands-Free Bag Holder carries bags comfortably without straining hands and fingers. It distributes the weight of heavy bags across the back and shoulder and eliminates tendon strain from carrying bags with a sustained hook grasp. The dense trilaminate pad provides excellent weight distribution while the 1.5 inches wide woven polypropylene strap holds up to 50lb. This lightweight strap can be easily stored in pocket or purse. 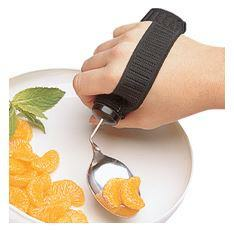 There are many other items available at healthproductsforyou.com for limited finger dexterity. Other essential holders like folding pan holder, grasping cuff and cup handle can further make day to day task easier and convenient.